Love ‘em or loathe ‘em there’s no denying that Status Quo are one of Britain’s best loved bands and there’s certainly no argument against the fact that they’ve made some pretty damn fine rock albums. This excellent documentary by Alan G Parker is a lengthy trip back through time to the foundations of the band in Catford, South London in the early 1960s. There are interviews of course with mainmen Francis Rossi and Rick Partfitt as well as Alan Lancaster and John Coghlan of the recently reunited original “Frantic Four” line-up. There is also significant input from other members notably Andy Bown, Matt Letley and John Edwards of the current ‘Heavy Traffic’ line-up, which confusingly is going to coexist alongside the original re, and former drummer Jeff Rich who offers some interesting stories as does manager Simon Porter. There are several notable contributions from such famous and varied names as Brian May, Ricky Warwick, Scott Gorham, Joe Elliott, Jeff Lyne, Paul Weller, Ginger and even Cliff Richard. These guys are fans and their fondness for Quo, particularly the original “Frantic Four” line-up, shows the breadth of influence Quo have had other the years. I’m not quite sure what broadcaster Paul Gambaccini (who recently declared that “the rock era is over…”) is doing here but he makes some valid points about the music industry as it was and is. The documentary is a very detailed although slightly off-balanced account of the band’s music. Indeed it details the varied line-up changes and divisions between former members but fails to acknowledge some of the band’s missteps particularly in the 1990s with trashy albums like ‘Don’t Stop’ and ‘Famous In The Last Century’ from 2000. The band’s appearance on Coronation Street and other marketing ploys are mentioned as is their high profile case against the BBC in the ‘90s over Radio 1’s refusal to play their music. Rossi and Parfitt have never been afraid of laughing off the criticisms they’ve received down the years and Rossi is his usual jovial self especially when taking about the press’obsession with continuously naming Quo a three chord band, which prompts Joe Elliott to talk about how highbrow critics love to praise the Ramones yet they could only play two chords. ‘Hello Quo’ is a very well crafted albeit slightly overlong love letter to the band and while they may not be to everybody’s tastes even the naysayers will find some entertainment in the film. 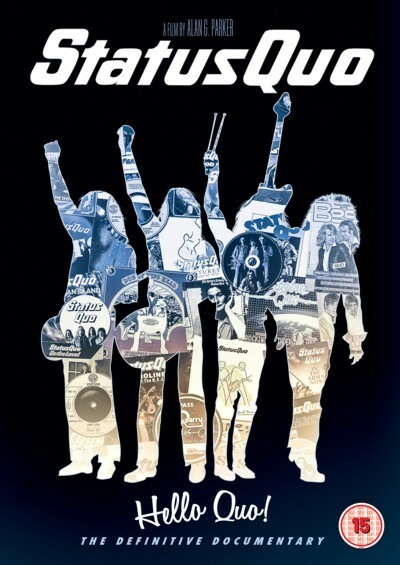 ‘Hello Quo’ is a fitting tribute to a remarkable band.